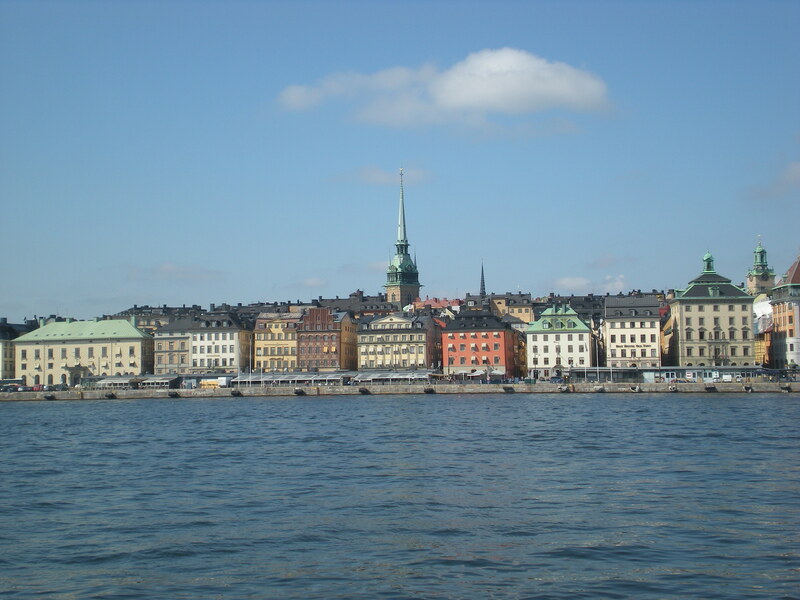 The first, and most important, thing to say about Stockholm is I LOVED IT! I loved the buildings, the food (although I did draw the line at pickled herrings for breakfast… just eeew! ), the fact that there was so much water everywhere – which I know is obvious seeing as the city of Stockholm is made up of a group of islands (14 to be precise), but I miss water sooo much living in Karlsruhe. The weather was fabulous too, with temperatures between 20 and 24°C (err, Google says 68 – 75°F) all week at a time when it got up to 40°C (104°F) in Karlsruhe. I would literally have DIED!!!! 24°C is much more my kind of temperature. It only rained twice, and both times it had stopped within a couple of hours and we were able to hide inside until it had passed, so that was okay. He came up to our table as well, hoping for a few crumbs, but K scared him away when he tried to get on the table so I never managed to get a close up picture. He never came back to the picnic area after that either 😦 There were also birds that kept flying up trying to get a few crumbs of food, including the biggest magpies I’ve ever seen! At least they looked just like magpies, only huge. Are there any other black and white birds that look exactly like magpies, only bigger? If there are I don’t know them. After eating we decided to split up as I wanted to go to the zoo part and K didn’t, so Jan and I managed to get some time on our own. I got to see reindeer and also real Swedish moose – albeit in captivity. Later we met up again and went back into town for food. I ate köttbullar, clearly a must when in Sweden. The next day the two boys had to register for the festival, so we all went across to the island it was being held on. We walked along the waterfront taking photos of boats, found a citadel and then went for lunch, after which the guys had their first workshop and us two girls went off on our own. We walked around, took photos and had tea in a wonderful little tea salon right next to a German church (those Germans get everywhere! 😉 ). The Vasa museum was another highlight – very interesting and we had a really cool guide. He told us all about the carvings on the ship – apparantly King Gustav II (the one who had it built) was known as the Lion of the North, which is why the ship had a lion carved on the front. The lion is holding a corn sheaf – called “vase” in Swedish, which is a similar word to Vasa, as in the House of Vasa aka the dynasty that King Gustav was part of, and which the war shop was anmed after. Well I thought it was interesting anyway! Here’s a photo of the ship, or part of it anyway. It’s too big to get the whole thing in one photo. Other things we did included a tour of the royal palace, where we also saw the changing of the guard (pretty impressive), a boat tour called “Stockholm: Under the Bridges”, which I really enjoyed (I love boats!) and also a visit to an amazing foodhall in a place called Söderhallarna, which is a fabulous indoor market thing on Sodermalm (south island).There was all manner of amazing looking food there. I also spotted an English shop on the top floor but K wouldn’t let me have a look in. *Sigh*. On our final day in Sweden, the music festival had finished, so all four of us went out for the day together. We got up ridiculously early and went to get a ferry to one of the islands of the Stockholm archipelago. The island we went to was called Gällnö and it has something like 40 permanent residents! There is a little shop and café, but when we were there both were closed (although the sign on the shop claimed it was open?!). We went for a walk around the island, saw loads of butterflies that even stayed still for long enough to be photographed and found a little red rowing boat, which we went out in, but other than that we mostly just sat in the sun and enjoyed the peace and quiet. It’s amazing that such a beautiful, remote place is so close to a capital city (which Stockholm is, even though it didn’t feel like one!). So there you have it. I would love to return to Stockholm and see all the things I missed out on – inlcuding Gröna Lund (Sweden’t oldest amusement park) and Junibacken – a museum dedicated to Swedish literature, in particular Astrif Lindgren. Or, as I kept saying every time I spotted the building across the water, “Pippi’s in there!!”. And that is all from me. If You’ve actually managed to read this far I commend you! Now go visit Stockholm and see for yourself how great it is. There’s no way my words (or terrible photography/random snapshots) could ever do it justice!.